​How you can help - Vote for Us! We are often presented with opportunities for grants and donations from corporations which require votes via their websites. You will be asked to give your email address, and sometimes have to register before you can vote. These opportunities can result in substantial donations to the charity, so they are very important to us. If you could spare a few minutes voting for Last Chance Hotel, we would be extremely grateful. If you could share the opportunity with your friends and family, so that they can vote too, that would be awesome! Please click on the links provided here. If you have any problems with the links, then please Google the organisation and go from their website. COULD WE ASK FOR 1 MINUTE OF YOUR TIME PLEASE? Animal Friends Insurance is running a charity giveaway at the moment which ends on Tuesday 5th March. £1000 for 10 charities is up for grabs, and this would be a great help towards our ever expanding vet bill. 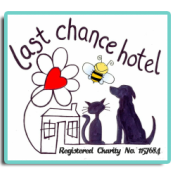 All you have to do is go to the Animal Friends Facebook page using the link below and nominate/tag Last Chance Hotel Cornwall, but you must also, AND THIS IS IMPORTANT, add a sentence as to why LCH is deserving of the award. ​The charities with the most tags/likes/reactions will be the winners, so please share with your friends to help the numbers. Thank you so much!